1. Draw a simple shape like a star or heart. 2. 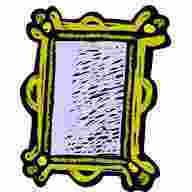 Place the mirror upright behind your drawing so that you can see it in the mirror. 3. Try drawing over your shape whilst looking into the mirror (keeping your eyes on the mirror all the time and not your paper). When looking in the mirror, the top of your picture becomes the bottom. This makes it very difficult to copy your drawing (especially when the lines change direction).